Zecharia Sitchin translated clay tablets, statue bases and monuments scribes inscribed in ancient Sumer. The scribes wrote that the ET gods said they made and trained us. When, as we validate Sitchin’s work, we see how they indoctrinated us, we transcend this mental mind-matrix they imprinted on us. Sitchin freed us to end war, persecution, short lives, famine, disease, pollution and suppression of women. The tablets show the Sumerians’ version of our solar system’s history for the last 4.5 billion years. 300,000 years ago, the tablets say, the ETS added their genes onto Homo Erectus’ to create Earthling-slaves. 13,000 years ago, as the ETs’ planet, Nibiru, neared Earth, the Antarctic icesheet slid into the South Sea and caused the Deluge, the ETS let most of the hybrid Earthlings drown. ETS also nuked Sodom and Gomorrah in 2024 B.C. and decimated the Earthlings of Sumer with radiation. Nibirans with advanced weaponry and biological pathogens killed hundreds of thousands of Earthlings. Sitchin, above, shows enlargement of a clay tablet Sumerians made for ETs from Nibiru who entered our sun-system and saw Uranus and Neptune (shown between the two standing figures). The ETs, whom the scribes called “gods” (the Bible’s Elohim), dictated the tablets and statue tags. Statues show the ETs looked like 7- 12 foot (and taller) Swedes with space-age weapons. These so-called “gods” lived millions of Earth years. They said an atmospheric crisis 445,000 years ago on Nibiru drove them to Earth for gold. Most Nibirans left Earth in 2024 B.C. Nibirans shaped our societies, bodies, thoughts and consciousness. They scripted us to obey males ranked in hierarchy, to disdain underlings and perpetrate violence. In 2000, Sitchin showed us clay-and-stone proof: rocks and inscribed records of astronomical, geological, geographical, chemical and biological info Sumerians said gods gave them, info our scientists only got millennia later. Sitchin solved the mysteries of missing hominid links never found since they didn’t exist. He showed how they periodically upleveled our society and its industries. No missing physical links existed since we appeared suddenly, when Enki and his cohorts added erectus genes to their genome. We got advanced technology when Sumerian “gods” gave it to us. Above, rocket in subsurface silo with symbol for rocket. Helicopter, two airplanes, Ziasudra’s submersible on ancient relief frieze, twenty-five feet above the floor on an Abydos temple Egypt. 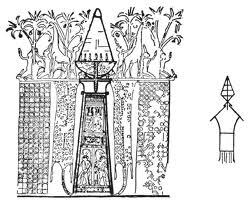 Hittite glyphs showed cruising missiles, rockets mounted on launch pads and an Anunnaki inside a radiating chamber. Unless ETs intervene to save us or the weight of Sumerian evidence convinces Muslims, Jews and Christians to give up their fear gods, their compulsions to unquestioningly obey government and religious authorities, their impulse to crush others and the mental programs with which the genocidal Anunnaki imposed on us to keep us divided and conquered, we’ll keep warring. We are one family and we’ve all been duped by the Anunnaki and their halfbreed successor-line of murderous manipulators. We must recover our oneness as a species. As we face new ET demands for our allegiance and gold, we can negotiate for life extension, medicine, free energy, space transport and other ET technologies. We and they can support each other and face our common challenges—environmental, social and psychological. The truth of our genetics frees us from the master–slave, god–devotee, boss–worker, lord–tenant model the ETs imposed on us. We can end physical and economic slavery, hierarchic obsession, derogation of women, gold lust, antagonistic religions and nations the gods and the hybrid elite they created dictated. Click arrow on icon below and hear Dr. Sasha and Janet Kira Lessin read Sitchin’s account of how he stitched together the documentary, The Lost Book of Enki, using ancient tablets and inscriptions. For the next post (Tellinger’s contributions to Anunnaki studies), click the word “Tellinger” here.